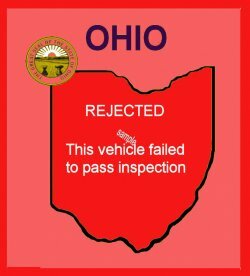 A Ohio Rejection sticker - $20.00 : Bob Hoyts Classic Inspection Stickers, Add a Final Touch to your Restoration! Ohio has for years had spot safety checks where you would receive a sticker if the car passed inspection. Here is a reproduction based on customers memory if the car failed an inspection. If anyone has a more vivid memory or an old original let us know, we will remake it and provide a free sticker to the person.